The CK Magma 3 Pocket Pouch Pack is ideal for keeping small loose items such as screws, clips or small tools close to hand. The ideal tool box accessory, saving you having to rummage around the bottom of your tool bag for those elusive odds and ends that just love to hide! 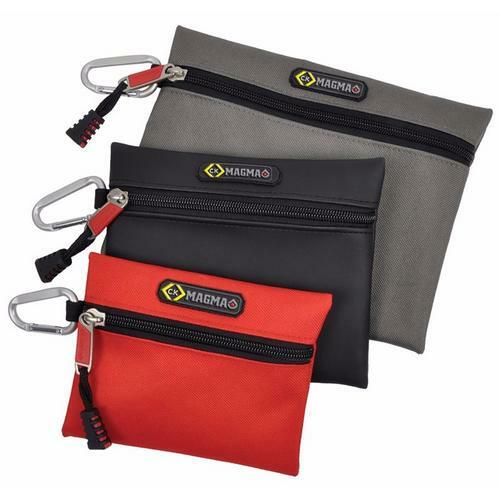 Made from durable polyester, each pouch has a zip closure to keep the contents securely inside. It comes complete with a metal clip to allow the pockets to be attached onto a belt or bag. The 3 Pocket Pack is a must have for any trades person. All my essentials are close to hand, thanks to the handy clip and is ideal for keep large quantities of small items secure making my work more efficient. I would recommend this to anyone.